As the economy around us seems to go from bad to worse it's important to be aware of activity that could impact you financially. Let's face it, times are tough and many people will resort to drastic measures to help themselves. I had the recent surprise of a box in the mail. I like getting stuff in the mail. Who doesn't? However, I wasn't expecting anything that would arrive in a box. Sure enough though, here it was. About the size of a shoe box it was. I opened it, and I was not surprised to actually find a shoe box inside. I wasn't expecting a bright pink shoe box, but truthfully I wasn't expecting anything, so what the heck, let's explore further. I opened the box. Sure, because of the pink box I was expecting ladies shoes. I really didn't have more of an expectation than that. What I got was clearly not the sort of shoes that I'd chose for myself - obviously. These were a black velvet, five inch heel pumps studded with metal spikes. They're a size 7.5(US). Now, had I in a fit of insanity ordered these and forgot about it they were clearly not my size, nor were they the right size for Tina. It then occurred to me that maybe someone else had access to my credit card. I checked my wallet and the card was still there. Good, it's not lost. So, I called the credit card company. After a short conversation with the customer service representative I determined that someone had been using my card for a variety of things. There were all sorts of Blackberry apps purchased (I don't own a Blackberry), there was also a subscription to Hulu, Netflix and Columbia House. I was glad I trusted my initial instinct and called the credit card company. Although there was paper work to be filed it was minimized by me catching it early. I should also mention that I was lucky that Shoe Dazzle decided to ship to the address listed on the credit card. That was the big tip off. A couple of days later I got a shipment from Columbia House. It was then I guessed that the person who was using my card number might be doing their Christmas shopping since they had ordered three of the same DVD. Again, it's nice to see that Columbia House ships to the address registered with the credit card. 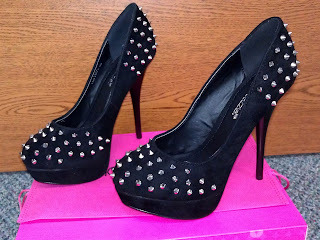 As amusing as it was to get a pair of spiky high heel pumps in the mail there was a lesson learned here. That being that these sorts of things can happen to any of us. We're all susceptible to this sort of fraud. 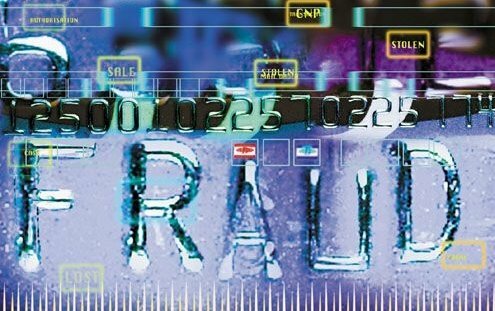 Friends, please keep an eye on your credit and debit card transactions. If you don't your Christmas spending might come to a quick halt when you discover your account has been emptied or your credit card maxed out. And while both scenarios are fairly easily resolved, it's not something that you want to have surprise you during your shopping trip, or when you're paying for a meal. I think they'd make a great addition to your wardrobe for any upcoming Lone Mountain concerts...You're sure they don't come in your size??? Had my card number stolen couple of years ago, just some minor stuff, and the CC company caught it real early. Funny thing was they ordered business cards and they were shipped to me. So.....I gave that info to the CC fraud department. Never heard anything from them if they found or prosecuted the people involved.